I am a firm believer in seasonal scents. I absolutely love L'eau Par Kenzo, but no matter how much I love a light, breezy scent, I just can't wear it in the autumn and winter. I love breaking out my richer, warmer perfumes, like Delices de Cartier. It's also a relatively inexpensive way to make a big style change. Many people must feel the same way, as there are about a hundred new perfume launches at the moment. I'm wearing Series 1 Leaves: Lily by Comme des Garcon at the moment, but it's so fresh and juicy, it smells like a garden with freshly cut grass. Perfect in the summer, but in the winter it would be like a eulogy to the sun we won't see again for five months. So, it was with a great deal of excitement I went shopping for a new perfume. I had a long list of contenders - the hotly anticipated new perfume by Issey Miyake, the new Prada Amber, the new Marc Jacobs just to name a few. But low and behold, I don't like any of them! Prada seems determined to only create perfume for women over 40. The Issey Miyake perfume was a disappointment (too similar to the original) and no matter how many times I see that Lola by Marc Jacobs perfume advert (Sheerlux, Net-a-Porter, etc etc etc) it won't make me like the scent any better. Or that ridiculous bottle. I've still to try out the new range of D&G perfumes, with packaging reminiscent of the Marc Jacobs range of splashes (which I love, especially the grapefruit sorbet, but alas, is only summer appropriate). 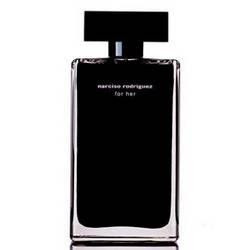 I might go back to my old stand-by - Her by Narciso Rodriguez, which breaks my rotational rule - I wear it season after season. It's a classic that I'll wear for a long time before I get tired of it.